The next evening I joined Ann and her friends and family at the Portland Marriot Downtown Waterfront hotel. The view was spectacular! I had never been on a Portland Spirit cruise, and let me tell you - it was SO nice! We cruised up and down the rive, and since it was March it was dark pretty early, letting us enjoy the downtown lights and the bridges as part of our continually changing scenery. Ann's dad wasn't able to make it - but the because of the wonders of technology her was able to say hi to everyone there from her iPhone! 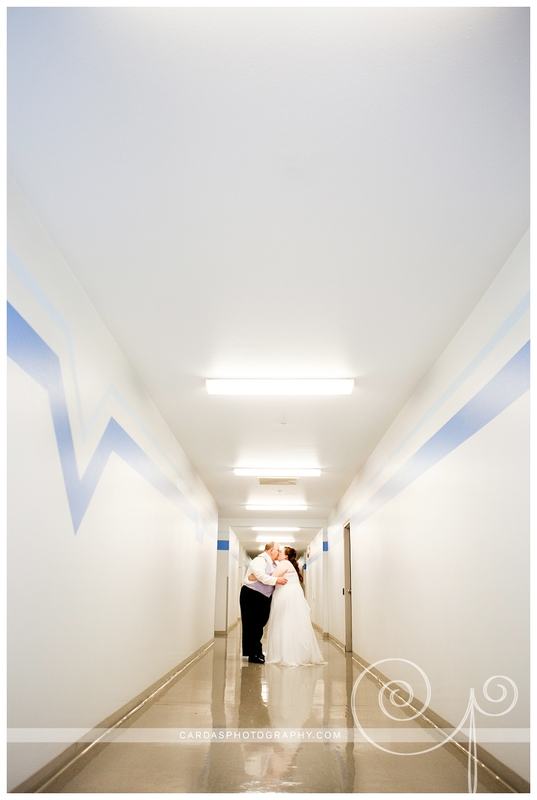 Angie and George were married at her mother's church in Tualatin Oregon. It was early December and the church was beautifully decorated for Christmas. There's something about tiny twinkling lights and white poinsettias to make it feel like a perfect Christmas wedding. The church was grand and warm - a perfect sanctuary for the cold and grey that was outside. The reception was held at the Local 290 Pipefitters Union Hall less than a mile away. More white poinsettias and rich purple decor met us there. The dance floor was hopping all night long! I love when the couple's personality is on display - these two are the world's biggest Pittsburg Steelers fans, and the "Terrible Towel" was an honored guest! And one last parting shot before I headed out. These two created such a beautiful day that paid tribute to family, friends and love - and that's what weddings are all about. I was so honored to be asked to capture it. One of my very favorite things about owning this business, and getting to do what I do, is seeing the same folks year after year - and watching them grow. Now, I haven't shot a wedding yet that I photographed the bride or groom as a High School Senior - (but I do hope that day eventually comes!) And certainly not someone as young as little Wyatt, but who knows? I might get to see him as a graduate, and maybe even a groom! I have known his mama Laura since college, I photographed her and John's Engagement Session - and then their wedding. It was fun to photograph this session in the same location as their engagement session in downtown Vancouver Washington. This little man definitely has them smitten - and why not? Look at the cuteness!! Thank you so much Laura and John for trusting me to capture all the major milestones in your family's life so far. I look forward to many more!